See? Just don't ask me which is which. Active Style Headphones Perfect for Sport and Fitness Enthusiasts Sony is also introducing a line of headphones that are designed to stay put when you're not. Whether on the treadmill, the track, or trekking through the mountains, the new Active Style collection features five headphones with a slim design styled with black silicone rubber with orange-red accents. In addition, all active style headphones have moisture-resistant features. The MDR-AS20J headphones fit around the outer ear with an earbud that sets inside the ear canal. The MDR-AS40EX headphones feature a convertible ear hanger so you can transform them from over-the-ear headphones to a traditional earbud style, offering users versatility and personal preference. 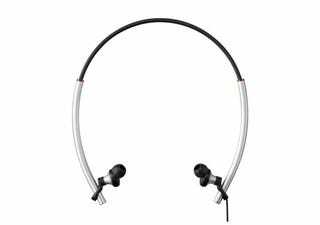 The collection also will include more traditional headband style headphones (model MDR-AS100W), behind-the-neck earbud headphones (model MDR-AS50G) and behind-the neck open air headphones (model MDR-AS30G). The headphones will range in price from $20 to $100.